1843 - The Prophet Joseph records it was extremely cold in Nauvoo and that “water froze in the warmest rooms in the city.” He traveled with Brigham Young to Ramus, Illinois, where he lodged with Benjamin F. Johnson. In an evening of fun, the Prophet pulled sticks with Justus A. Morse, “the strongest man in Ramus,” and pulled him up “with one hand” (History of the Church, 5:302). 1844 - The Prophet Joseph met in an organizing meeting with many of the leaders of the Church to form the Council of Fifty. The group was organized to help with the planning for the future of the Kingdom of God. The Prophet discussed the prospect of “secure a resting place in the mountains, or some uninhabited region, where we can enjoy the liberty of conscience guaranteed to us by the Constitution of our country” (History of the Church, 6:261). 1845 - The leadership of the Church met with Brigham Young and it was decided to send those who had writs for their arrest on missions. The mobs would get writs against the brethren and then cause problems when the Saints would try to legally fight them. It was decided it would be best to avoid the situation until the Temple was completed and they could prepare to move west. 1882 - A town site in the Snake River Valley of Idaho is selected and named Rexburg after its founder Thomas E. Ricks. 1941 - President Heber J. 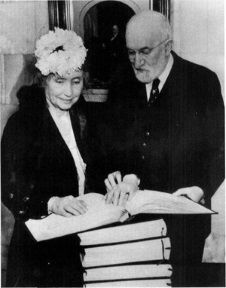 Grant presents a copy of the Book of Mormon in braille to Helen Keller during her visit to Utah. 1956 - The Los Angeles California Temple is dedicated by President David O. McKay. 1977 - On his return from an extended trip to Latin America, President Spencer W. Kimball met with President Jimmy Carter in Washington D.C.
1982 - The restored Sarah Melissa Granger Kimball home in Nauvoo, Illinois is dedicated by Elder Dean L. Larson, of the Seventy. In the summer of 1842, Sarah Kimball and her seamstress, Miss Cook, began to make shirts for the workers on the Nauvoo Temple. Their efforts expanded and a group of ladies met in Sarah’s parlor and organized a Ladies’ Society that was to become the Nauvoo Relief Society. Later, many Relief Society gatherings took place in Sarah’s Nauvoo home. 1992 - President Gordon B. Hinckley, of the First Presidency, presents the Vatican Library in Vatican City with a copy of the five-volume Encyclopedia of Mormonism. 2000 - The Oaxaca Mexico Temple is dedicated by President James E. Faust of the First Presidency. 2005 - The First Presidency, President Gordon B. Hinckley, Thomas S. Monson, and James E. Faust, had “a conversation with the media” to note the 10th anniversary of their administration. 2011 - A massive 9.0 magnitude earthquake and tsunami devastates portions of northern Japan. The Church immediately began providing direct assistance and support of food, water, and other supplies as needed. More than 70 tons of supplies were distributed in the first two weeks after the earthquake. 2019 - The gathering of leaders of the Church in Rome for this photo marked the first time in Church history that every member of the First Presidency and the Quorum of the Twelve Apostles had been all together outside the United States. Every senior leader also participated in the Rome Italy Temple dedication.